I worked in an office. I answered the phones. I did whatever projects that got laid on my desk. Fluorescent bulbs washing me away. No window to the outside world. Slowly the running joke that I was “in prison” started to feel more like my reality. Getting “yard time” during lunch, having to find someone to watch the phone so I could pee, and breaking my bladder all too often. Almost 7 years and all the same weekly and annual routines started feeling like a really bad Groundhog Day movie remake. But this was my second job at a desk with no window. So make it 10+ years. I had a what I called a Retirement Party the evening of my last day of working in an office. May 8th was a bonfire and and dessert night with my loved ones. 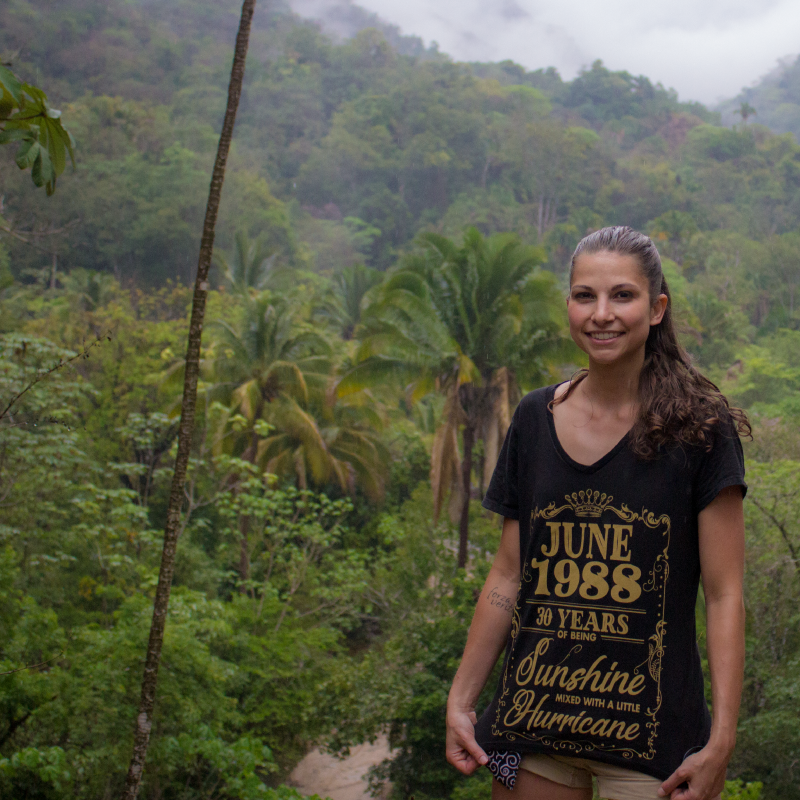 One month later I turned 30 in the jungles of Mexico. My version of a midlife non-crisis. I had the desire to make my art functional. To make something beautiful that is useful, in demand and empowered the customer who purchased it. How could my art make a someones life better? To help make their dreams come true? I became a Branding Designer and a Website Designer with knowledge of Online Business & Marketing Strategy. Do you have this feeling that you are not pro enough or qualified enough to be sharing your knowledge? To be writing articles and providing content for your ideal audience? This is very common in the first years of business. Actually, this is something that all entrepreneurs face from time to time even when they have 6 figure businesses. I really know your story and current “know-how” is going to be so valuable to someone else. You don’t have to have it all figured out before you provide valuable content to your audience. Analysis paralysis is being so terrified of making the wrong decision that you put off making any sort of decision at all. Dammit. Seriously. Decision fatigue is a thing. I know this ache too and it can only get worse if it’s being pressured. Minimize your decisions, remove distractions. Intentionally limit the amount of information you consume. Start before you feel ready. Give yourself grace and don’t overload your plate. Often all the overthinking and over analyzing makes us think think we’re busy all the time. Feeding that “I don’t have enough time, I can’t do ALL THESE THINGS” mentality. Deep down, humans want to make the wrong decision because we don’t want to fail. But the fact is, we all have failures and successes. You might not see them behind the Instagram feed. So forget what you think your success or progress should look like, let it just be natural. Your journey is yours alone. Don’t get hard on yourself or feel like a failure if something that seemed to work for someone else didn’t work for you. It’s not the end, your just in the stop to get and do something that will ultimately be better for you. Other times we might be judging to soon and need to give something more of a chance and nurture it more. TAKE RISKS. GO WITH YOUR GUT. If you know something is a good decision but “you’re not ready yet” Kick "Ready in the freakin face. Muster your 15 seconds of Courage and just do that thing. Send that email, buy that course, call that coach or designer. If you feel yucky and sick to your stomach? Then listen. Something is not right. Take a step back, get quiet. Stop consuming so much from others and tune into your inner voice. It might take months until you feel something is good enough but you will never have a business if: you don’t just publish that blog, start that marketing campaign, put out that product you have now, or just start serving people the best way you can, right now. So you have a ton of decisions to make. In every aspect of your business. I sure did. Especially in the first 6 months. Should you choose Squarespace for your website? What colors do you use for your branding? How do I choose social media channels for my business? What images do I put on my website and where do I find them? What tools and apps should I actually pay for? What can I get by skipping right now? The more you read the more questions that seem to come up and choices that need to made. Am I right? Then the big one’s surface. I am I doing this online business thing right? Will people like this? Will they like me? Am I worth what I am charging? I have asked myself ALL these questions too. I still ask myself some of them today. Asking yourself questions is great. Never stop doing that. HOWEVER THERE IS A WRONG WAY TO DO IT. Whatever question your brain is asked, it will find or make a reply to. Don’t ask yourself questions that dis-empower. Within your question don’t focus on the problem or the fear. Focus on the solution. What don’t I like about this? What’s wrong with this? Why am I so unmotivated? What do I like about this? What can I do to make this better? What would make this fun? Feel your feelings. If your gut and first intuition is telling you something, listen. The more you look around the more solutions, hacks and input that clashes will overload you. Find 1-3 mentors in your field. Put all your ideas and the advice through the filter of what they do and teach. My first mentor is Marie Forleo. If it’s not something that Marie teaches or would do, or my other 2 mentors, then I skip over that advice. Stop checking out the people who have been in business for years and years and then beating yourself up that you are not where they are. They were in your shoes once too and it could very well have been way more screwed up. That is where some big lessons get learned. In experiences and mistakes. When you have a day that you feel like a badass and can take on a dragon. Write yourself a letter. Why are you doing this hard, uncomfortable thing? What powers do you have and how awesome are you? You’re so awesome! You really can do this. Starting out is hard. Much harder than when you get the word out and start attracting your ideal clients later. Especially in a service based business. You’re working closely with the people that pay you and there is some form of back-and-forth going on. You might be a designer, writer, or coach and this applies to everyone. In graphic, branding and website design this is a big thing. You’re create something to represent someone else and their ideas. I take that very seriously. It’s a process. They might have an idea in mind or might have no idea what they want; not good. My first year of work came mostly from a few connections in Facebook groups, referrals and a platform called Upwork. No matter where you’re finding your clients and customers everyone is going to have their opinion of how much this should be worth and how long it should take. I have seen people offer $20 for a logo and get many freelancers desperate for work and doing a quick shoddy job. Sometimes even ripping trademarked images off Google! These people would be climbing all over the job like it was a zombie feeding frenzy. Although this is hard stick to your guns and try to pick only the best projects and clients. This is the 1st thing I attribute my first year of success to. Doing great work with great people. I give my ethics and this stamina the credit for the “Rising Star” badge on my profile in the first couple of months. And I now have a “Top Rated” 100% Job Success badge on my profile now. I still fell into some situations that were not ideal and these things have taught me some awesome lessons. I’m very thankful for them and their outcomes. Don’t be afraid of making a mistake. Those can be the best lessons. No analysis paralysis right?! Go with your gut and keep moving. The person you are working with should be the decision maker for the project. Set a time frame and stick with it as best as you can. Be a firm as you can with it. Don’t start working with a client until you have everything you need (if you can help it). Set the rules and workflow yourself. Clients want to be guided. You both are so much happier when everything is decided and explained before getting started. Despite your circumstances, to a large degree - YOU DESIGN YOUR REALITY. (I was there for a decade, I totally get it!) We can dream our dreams and design their realities. Much of my first year was behind a computer and that is OK. Things are not going to happen overnight. Find joy in each accomplishment. But even though I had not yet lived my passionate dreams of enjoying all this freedom as much as possible. I don't have to wait for someone to cover the phone to pee. I can wear T-shirts, Jeans and Yoga pants to work. I have been able to see my family more and be there for them more. Such amazing things need to be enjoyed and savored. Navigating the work-life balance is actually more challengin as an entrepreneur. You’ve got this. I know you can make great decisisons for you, your family and your business. Want some assistance with that? Download your free guide to Achive Your Dreams & Design A Life you Love while Mastering Motivation. Your guide is on it’s way! ﻿I’m a work in progress. You’re a work in progress. It’s a beautiful thing, that give hope and joy about what we can do and become. Wherever you are keep dreaming and make a plan. Work each day, no matter how little, towards your dreams. Book that trip, make time for you in the morning. Read for 15 minutes a day. Listen to a podcast on the way to work. What’s your favorite passionate dream you want to bring to life?